Two years ago I raised Broad Breasted White and Broad Breasted Bronze turkeys. I processed them myself so I know it was done as humanely as possible. The problem with raising broad breasted turkeys is that they aren’t able to mate naturally. The males grow so heavy, with so much meat on their breast, that they are unable to breed. The commercial hatcheries use artificial insemination, and that ain’t happening on my homestead. So, although they were tasty and the poults cost less, I’ve been hoping to find some heritage turkeys for my homestead. Narragansett Tom and Hen in my coop. I had a hard time committing to an order of heritage turkeys through a hatchery. 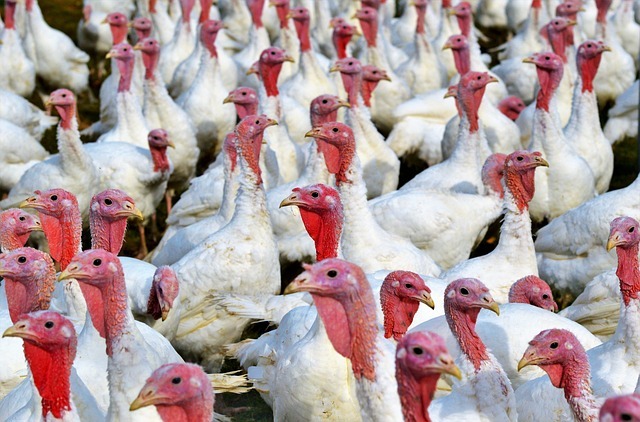 Most hatcheries require that you order 15 turkeys to fulfill the minimum for shipping. 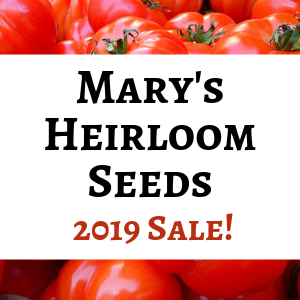 Heritage breeds start at $11+ per poult and there are shipping fees on top of that. So I was looking at an investment of close to $200. Not to mention the cost of feed to raise that many turkeys…that’s a big commitment. When I saw a breeding trio of Narragansett turkeys for sale on Craigslist, I was very interested. The gentleman was charging $75 for the trio, not a bad price considering the feed it takes to raise them. The birds are 10 months old, so the hens should start laying this spring. The biggest issue was the drive…over an hour each way. But I sucked it up, made the drive, and brought home my new turkeys on Sunday afternoon. The new birds are in their own room in the coop while I watch their health and let them grow accustomed to their new digs. They were in a small cage at their former residence, so I think they’ll like our big pasture this summer. Hopefully the hens will lay enough eggs for me to hatch and raise enough turkeys for our table this year. I’m looking forward to watching my little turkey flock grow. 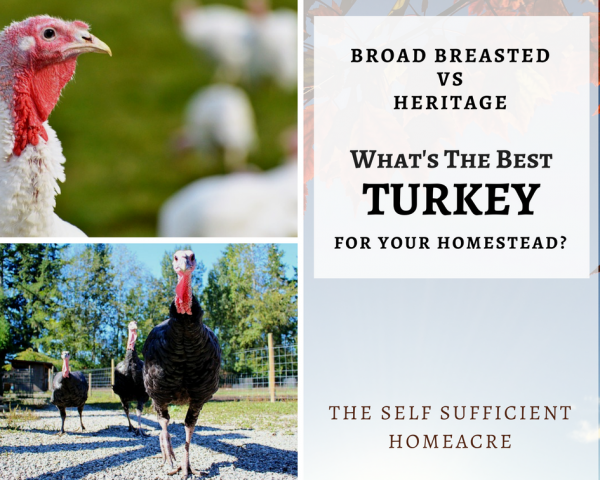 Do you raise heritage turkeys? Leave a comment! Ah yes…guineas sound like fun to have. 🙂 I think my neighbors would really complain if I got some! I bet you’re excited about collecting eggs…it’s such a nice feeling to bring a basketful of eggs in from the coop. 🙂 Good for you for planning to donate! Yep…I’ve had too many for quite some time and this year I made up my mind that I need to downsize. So I can sympathize with anyone having trouble keeping the poultry within normal limits!!! This is our first year raising poultry. We have 55 chickens, 4 Blue Slate Turkeys, and are waiting on an order of 5 guineas to hatch. So far so good. 32 of the chicks are outside to free range. They are now 8 and 10 weeks old, and have been outside since 2 and 4 weeks old. They roost in an 8×20 coop at night. The other 23 chicks just turned 4 weeks, and are about to be introduced to the 32 “playpen” style inside of the coop this weekend. We knew that we wanted turkeys, and had our hearts set on Narragansetts. We were warned that turkeys were very hard to raise from poults. Now we understand that this only goes for the commercial breeds. Turkeys are not as stupid as people think. The opportunity of purchasing Narragansetts was not offered to me until I had put money down on our Blue Slate babies. We picked our’s up yesterday and did not have to put pre-cleaned coins in the water for them to continually find the water. We dipped their beaks the same way that we dipped or day old chicks. The four of them are friendly and love to play. Currently they play a bit, eat and sleep. Oddly our new additions are okay at 85°. The pant and look limp with the extra heat. We do not have air conditioning in our home, so it is easy to warm the chick room where the brooders are. The poults prefer not to have the heat lamp on most of the day. With the room harboring a chick brooder, an incubator, and a Bearded Dragon terrarium there is enough heat to keep the room at 85° during the day with the windows open this May. At night we do turn on the heat lamp for them. The Brinsea 50 heater would not fit into their smaller brooder. It is the only other heat that we have available. We plan to integrate all of our birds using the playpen method. It worked with our 32. We hope that it continues to do so. I am hoping that it all works in our favor. If you have any other tips for us please advise. You have been helpful thus far, and eased my nerves about our new crew. It sounds like you have everything very well in hand! I never had trouble raising the turkey poults either, even with the broad breasted breeds…you’re right, they aren’t stupid like people think. I never had them do anything dumb. I do find that the turkeys need more protein than chickens, so you might want to give them some split peas (ground for the little ones and whole when they are older) or other source of protein. When they go outside they can get some bugs for themselves. Enjoy all those little babies! After we get the guineas we will be finished for the year. I see how things can accumulate. I have seen to many with more than they need, and still purchasing more. I vowel not to be that person. We may have more than we need now. Lol. We are now looking for places for our eggs to go. Some will be donated. Thank you for the extra tips. I was wondering how much of the split peas do I need, or what is a good ratio to the feed? I don’t measure…sorry! I give the whole flock one scoop of split peas and wheat berries every morning and another in the evening. I would say that each scoop is about 2 quarts. I have 10 turkeys (broad breasted, about half grown), 8 ducks, and around 20 chickens that I’m feeding the peas and wheat to. They also get regular feed. I’ve heard that turkeys are great for an orchard. We have 3/4 acre in the city and I’ve been hesitant to get them, not sure of the noise they make or whether they stay in their own “yard”. Could you comment on this for me? They do make their gobbling noise…which I don’t think is bothersome, but then I like my rooster too! I think they would wander around if you don’t have fencing and clip the feathers on one wing. Ours have been real home bodies so far, they are happy to stay in our pasture. But some might be more adventurous! An acquaintance of mine has just purchased some heritage turkey eggs she’s hatching out herself. One point she made about having your own breeding turkeys is that the male is fertile only at 2 years of age while the female can start laying (unfertilized) eggs at 10 months. So, in addition to the Royal Palm chicks that have just hatched, she’s also purchased a true breeding pair of Narrangansetts. we LOVE our Bourbon Reds, we have yet to keep any babies alive, but we have a new gameplan this year. our fingers are crossed(they are not the smartest babies :(). Uh oh! I hope I can keep some babies alive! I had pretty good luck with my broad breasted poults…but I was kind of a helicopter mom 🙂 Thanks for sharing! Best wishes with your turkey project this year Erin! I bet you’ll be sharing some posts on them too 😉 I hope you find a heritage breed you like! Best wishes! 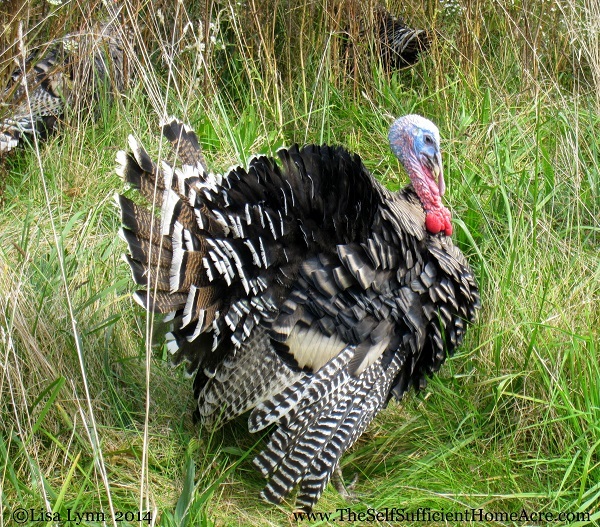 We never intentionally had any turkeys; however, a wild turkey took up residence in our yard some years ago. We named her Gobbles and she was quite entertaining. She did not like our rooster Mr. Fred and they had terrible fights through the chain link fence. Our chickens at that time did not free range and had their own yard. Gobbles wandered about wherever she wanted. We had to line the fence with chicken wire to prevent either of them from getting their heads in or out of the chain link. She severely wounded Mr. Fred before we took this measure. Gobbles stayed for several years until she eventually succumbed to a respiratory infection which turkeys are especially prone too. It sounds like Gobbles found a nice place to live out the rest of her life! Too bad they couldn’t all just get along. 😉 I hope my rooster and these turkeys get along ok…they will be in the same pasture. Do you know what the respiratory infection was? Thanks for sharing your story about Gobbles! I don’t know what the infection was. When I had the vet out for a regular maintenance check on my little horse, I asked him but he was very non-committal on what it was or how to treat it. We corralled her into my horse trailer and tried antibiotics in her water but she wouldn’t drink much or eat. She was too wild to catch and I didn’t want to traumatize her. She was sneezing and her eyes were swollen. We made her as comfortable as possible with shavings and a heat lamp in the trailer hoping she could recover but she passed away. Of course, it was during a very cold and windy spate of weather so that undoubtedly contributed to her illness. She could easily have caught something from the wild birds in the yard. The animosity between Gobbles and Mr. Fred didn’t start immediately. He must have said something rude & crude to her in rooster speak! and she wasn’t having any of that nonsense! I want to try Bourbon Reds this year. It will be my first year raising turkeys! That’s awesome! I’m not as familiar with the heritage breeds as I’d like, but I’ve been drooling over them in the poultry catalogs for several years. 🙂 I think that there’s variation in a lot of the breeds, depending on where you get them. Best wishes with hatching some eggs or buying some poults this year! And stop back to let me know what happens…I’d love to hear if you get some going this spring! We did raise our Thanksgiving turkeys last year. We hatched them in an incubator. We were told they were Spanish Black/Wild mix. 3 of 6 hatched. One of them looked like a wild turkey. The other two were not as claimed. I actually think they were Royal Palms crossed with something. They looked quite a bit like Royal Palms, but were bigger. Providing our own Thanksgiving dinner was really nice. I am really hoping to get some more eggs or some poults soon! Can’t wait to see your new hens! Have fun with them 🙂 Pretty soon you’ll be addicted and you’ll be looking at ducks and turkeys! Best wishes! Hi Lisa. I’ve never raised turkeys, and usually buy my turkey from a small, local farm that raises broad breasted whites. However, just last weekend we cooked a pastured heritage breed turkey from Ayrshire Farm (which I got as a prize for winning the Certified HUmane holiday recipe contest!). Let me tell you, despite the fact that it had been frozen, it was the tastiest turkey we had ever had. Very rich and yummy in flavor, especially the dark meat. No special cooking process, just roasted at 350 and basted as usual. So all I can say, is that it’s definitely worth it to try heritage breeds! Ayrshire Farm may be a source of info for you. Some of the breeds they raise are American bronze and Royal Palm. Cool prize! How fun is that! I’ll have to look them up, thanks for the info. I love the look of the Royal Palm and it was one of the breeds I was considering if I ordered from a hatchery. Your turkey sounds so good…now I can’t wait for Thanksgiving. Oh wait, yes I can!